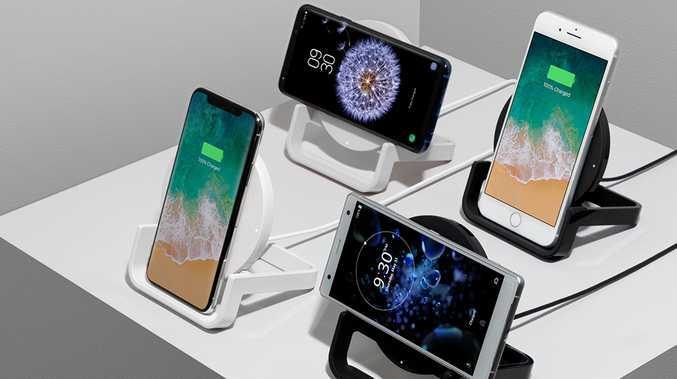 Some of Belkin's range of wireless chargers. WIRELESS charging is one of the selling points of the latest mobile phones - and even Apple's new Air Pods 2. So when Apple officially killed off its AirPower product, you could almost hear the global groan of its fans. Apple had touted the product in September 2017 - a product to charge your iPhone, Apple Watch and AirPods at the same time. When the company went quiet on the product, reports emerged Apple was having issues with the multicoil design of the charging pad and was struggling to solve overheating problems. Apple finally admitted defeat, citing an inability to achieve the high standards it expects from its products. But it's a market that third parties will quickly fill. Qi is an established evolving wireless charging standard that is backed by over 200 leading companies. Some standard Qi products include the iPhone X, iPhone 8 Plus, iPhone 8, Samsung Galaxy S8 and Samsung Galaxy Note8. Belkin advises wattage and speed are important when considering what charger to purchase, as specific phones are most efficiently charged by a particular wattage. For example, iPhones best charge at 7.5W, but this doesn't mean that they won't charge on a 10W charger. It's about finding out what is the most efficient for your device. You can find out more about wireless charging via Belkin's site here.